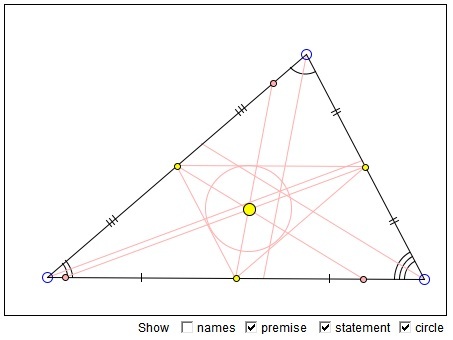 The applet below demonstrates a simple fact that the cleavers in a triangle are concurrent. Moreover, they concur at the incenter of the medial triangle - at the point, otherwise known as the Spieker center. Indeed, each cleaver passes through the midpoint of a side parallel to the bisector of the opposite angle. Since the sides of the medial triangle are parallel to those of the reference triangle, the cleavers of the latter serve as the angle bisectors of the former and hence concur at the incenter of the medial triangle. Sometimes the point is also referred to as the cleavance center.